“Dallas” fans love Sheriff Derrick, the loyal Ewing friend who is forever getting the family out of trouble. 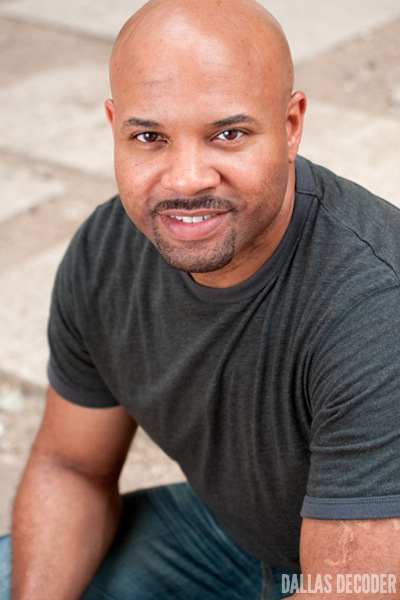 I spoke recently to Texas-based actor and screenwriter Akai Draco about his role as the show’s top cop. Sheriff Derrick has the hardest job on TV: trying to make the Ewings obey the law. Is that how you see it? Yeah, a little bit. The nice thing is Derrick is a friend of the Ewing family, so they can call on him when they need help. He does what he can to make sure the Ewings get past the bad guys who get in their way. Sometimes he gets yelled at, but hey, it’s all in a day’s work. We don’t know a lot about Derrick. What do you think he does when he isn’t rescuing the Ewings? That’s a good question. When I got the role, I didn’t know a lot about him other than he’s a friend of the Ewings – a friend of Bobby’s, specifically. So I sort of invented my own backstory. To me, he’s just one of those good guys who plays it pretty straight and narrow, except when it comes to Bobby and the rest of the Ewing clan. He’ll do them a favor here and there. Derrick seems like a nice guy, but you never know. He could have his own aspirations. I don’t think it’s an evil agenda or anything like that, but maybe we’ll find out he has aspirations beyond being sheriff. We’ll see. I’ll leave that to the writers and producers. I definitely want to see more of Derrick in Season 3, but I hope we never find out he’s up to something nefarious! I hope not too! The bad guys on this show tend not to last very long, especially when they get in the way of the Ewing clan. So hopefully Derrick will stay on the good side of the law. Did you watch “Dallas” growing up? I did. I didn’t watch every episode, but coming up in the late ’70s and early ’80s, “Dallas” was one of the big things on TV – especially when the “Who Shot J.R.?” thing came around. So you couldn’t help but get into it. It’s kind of funny to think back to those days and realize that I’m now part of the reincarnation of the show. It’s such a pleasure and a privilege to be part of something that great actors like Larry Hagman have been part of. What’s it like to work on the show? This is the fifth show I’ve worked on and it’s by far the most fun I’ve had as an actor. Everyone – the cast, the crew – they’re a joy to work with. They’re all very selfless, hardworking folks. Everyone involved with the show has kind of become like a family. So I’m really excited to be a part of it. Can you talk a little bit about how much work goes into the show? How long does it take to film a typical scene? It really depends on the scene. A lot of different factors go into it: the location, the lighting, the camera angles. I’ve done scenes that have taken as little as 30 minutes versus scenes that have lasted a day or two. Oh, wow. Which scene was that? There were a couple. In one of the latter episodes from Season 2, they had me looking out for some of [Harris Ryland’s] trucks. The entire thing was shot over a couple days. You can’t always tell how long these things are going to take to shoot. Sometimes unforeseen things happen, but this show is put together by really great directors and writers and producers. It’s a really well-run show. What goes in between takes? Do you get to spend time with the rest of the cast? Depending on what’s going on – if it’s just a matter of moving lighting and cameras and that sort of thing – we’ll sit around and chit-chat. We’ll get on the phone and text or whatever. If there’s a long break and they’re changing locations, we might go off on our own. But usually between takes we’re kind of sitting around and shooting the breeze. So tell me: Is Patrick Duffy as cool in real life as he is on the show? He is very cool. He’s extremely down to earth. He’s a veteran. He’s been around the business a long time so he doesn’t let stuff get to him. Everyone on the show is great to work with. They’re all really nice people. You also work in the tech sector, so acting is kind of a part-time thing for you. Is it something you’d like to do regularly? I don’t know if I’d call it part-time. It’s one of those things that I do as much as I can. Some days, it’s full-time. Other days, it’s part-time. It’s such an unpredictable business in general. Because I’m one of the supporting characters on the show, I don’t really have a set schedule for when I’m going to be shooting. I usually find that out maybe a week in advance. But whenever I book [an acting job], I drop everything I’m doing and I’m all in. I would love to be able to be a writer and actor full-time. That’s my goal eventually. I would love to start with “Dallas” and commit more time to Sheriff Derrick and anything else that comes after that. And “Akai Draco” is your stage name. How’d you come up with it? When I first started acting, I knew I wanted a name that stood out. So I decided I was going to pick something that had some meaning to me. “Akai” is the Japanese word for red, which is my favorite color. And I picked a Japanese name because when I was a kid, I got into martial arts, which went on to become a big influence in my life. And “Draco” is Latin for dragon. I’ve always been a fan of dragons and I wanted a Latin name because my wife is Latina and my wife and kids are the other big influence in my life. What do your kids think when they see you on TV? Plus, it’s got to be fun to have a dad who’s a sheriff. Exactly. Historically, I play a lot of cops, so anytime she sees a show with a lot of police officers, she says, “Dad, you could be a better cop than him!” I’m happy being Sheriff Derrick right now. If they’d give Sheriff Derrick more screen time, I’d be even happier. Speaking of sheriffs: Have you met Barry Corbin, who played Sheriff Washburn on the original “Dallas”? I know of him. I’ve not met him. He recently sent me a note on Facebook, which I thought was pretty cool. And in the small world department, it turns out you and I both grew up in Prince George’s County, Maryland. My father is retired military, so when I was born we lived on Bolling Air Force base in Washington, D.C., and later Andrews Air Force Base in Maryland. We moved a couple of other places in between, but eventually settled in Upper Marlboro, Maryland. But for the most part I grew up in Prince George’s County. My parents are still there and my brother still lives in the area. I try to get home a couple of times a year. Well let me say this: I’m no actor, but if ever Sheriff Derrick needs a deputy, your homeboy back here in D.C. will gladly volunteer for the part. [Laughs] I’ll let them know. 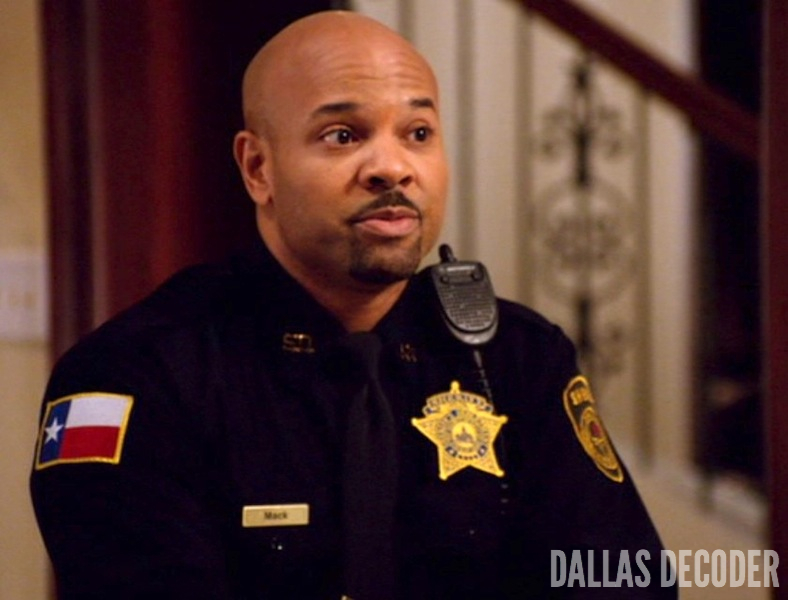 I love Sherriff Derrick on “Dallas”. Great interview with him and I hope we see more of him in Season 3!! Great actor too! Thanks Jennifer. I agree: More Sheriff Derrick, please! 1) What is his given name that he felt he had to get so creative with his stage name? 2) Does Sherriff Derrick ever have to do any kind of cooperative investigative work with collegues from Braddock County? By the way, do we know the full name of Sherriff Derrick? From your lips to the TNT publicity department’s ears, darlin’. It is great to hear that Barry Corbin is still alive and reached out to the new Sherriff in town. I like Sheriff Derrick and enjoyed his scenes in Dallas. He seems like someone with integrity and will do what he can for the Ewings especially Bobby up to a point. I have a feeling we will see more of him. The “Red Dragon” will long be remembered. He really does look like a police officer. I found it interesting that he is also a writer. I am going to check out his website when I have more time. I think it is so cool that he is a D.C. area celebrity. I might live in Northern, I still consider PG County and Upper Marlboro, MD local! Jump, do you live in Northern Virginia? (I think you accidentally left out “Virginia” in your message.) It’s nice to know there are some “Dallas” fans in my neck of the woods. Yeah I do live in VA, just south of the beltway. I know that I can improve my posts with a simple proofreading. I am usually at work when I reply to posts so I am usually a little hurried. Yeah it’s cool that there are Dallas fans in the area. barry corbin was also the attorney reading jrs will.. Yes he was. Good eye!